Garett K. Kirts is shown being brought into the Newton County Courthouse for his first appearance. As a result of the investigation Kirts was initially charged and arrested in Jasper County Monday after a brief police pursuit on a Jasper County charge of resisting law enforcement and was held at the Jasper County Jail. 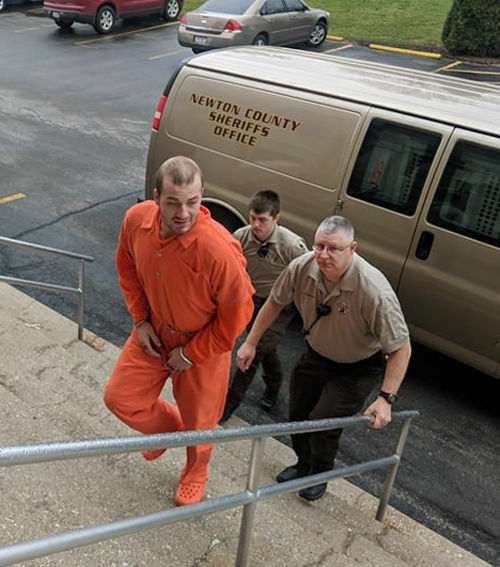 An arrest has been made and charges filed against Garett K. Kirts, 21 of Lebanon, for the murder of Nicole Bowen, 30 of West Lafayette, whose body was found Saturday afternoon in rural Jefferson Township just two miles northwest of Kentland. Kirts made his initial appearance in Newton County Superior Court Friday morning, where Newton County Prosecuting Attorney Jeff Drinski filed one count of homicide against Kirts along with notice to seek life without parole based on the aggravating circumstance that Kirts allegedly tortured Bowen while she was still alive. Kirts is also being held at the Newton County Jail without bond. A not guilty plead was entered for him and he asked for a public defender. An Omnibus hearing has been set for June 12 at 8:30 a.m.
Drinski told the Newton County Enterprise that officials believe five people were involved with two still not in custody. On April 2, Jasmine N. Parker, 34 years old of Kentland, IN was charged for assisting a criminal in connection (Level 5 Felony) to Bowen’s death. The next day Ashley N. Garth, 26 years old of Delphi, was also charged for assisting a criminal in connection to Bowen’s death. A warrant has been issued and is outstanding for Christopher (Chris) Channing Mathis, 27 of Kentland for assisting a criminal. Anyone with information as to Mathis’ whereabouts should call the Newton County Sheriff’s Office 219-474-5661. The fifth suspect’s identity has not been released due to investigative purposes, stated Drinski. Agencies that have been active in this investigation include the Newton County Sheriff’s Department, the Newton County Coroner’s office, Newton County Prosecutor’s Office, Indiana State Police, Jasper County Sheriff’s Office, Jasper County Coroner’s office, Rensselaer Police Department and the FBI, who helped in the identification of the body.